Thank you to Shaw’s for partnering with me on this post through Kitchen PLAY. I was compensated for developing this recipe. 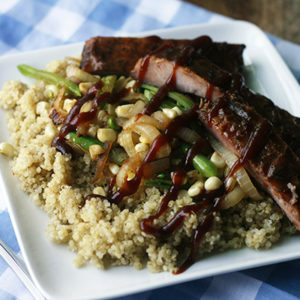 Sautéed veggies and protein-rich quinoa combine with succulent ribs for this delicious Quinoa with Ribs and Sautéed Veggies recipe. We’ve reached the part of the school year where I am quietly ticking off the days until summer vacation arrives. There’s a lot to love about the school year, and I adore hearing my kids discuss what they’ve been learning. They are two grades apart, so it’s fascinating to compare how my daughter’s experience (she’s the younger one) compares to my son’s in the same grade. And, for that matter, how their homework loads have differed. 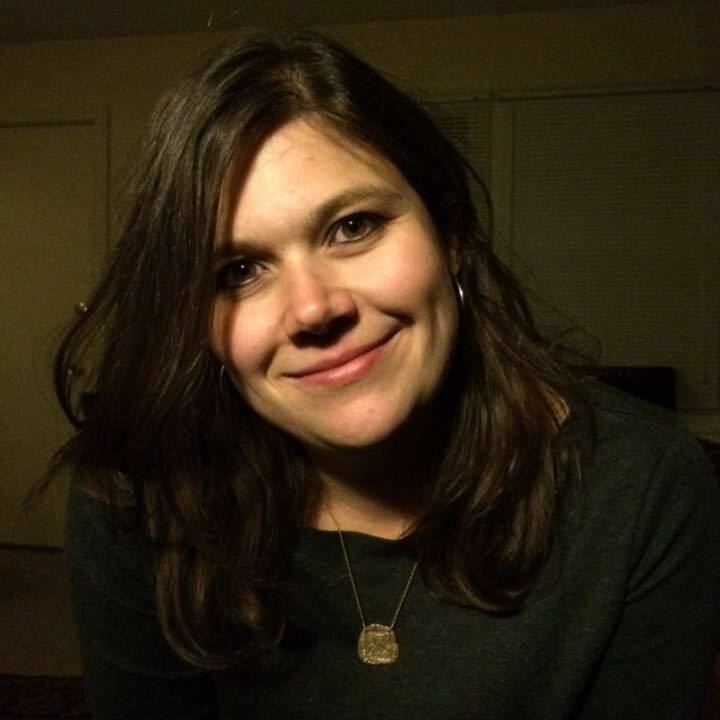 That said, I love summer. The warmth, the sunshine, the freedom. Truly, I can’t wait until we have a few months free from the responsibility of schoolwork and the firmness of the scheduling. Even with camps thrown in the mix, summers are just so much more freeform for us. In the meantime, we’re wrapping up all the school year stuff — there’s performances and a few last track meets, awards ceremonies and projects due. So for a few more weeks at least, we’re as time-stretched as ever and in need of fast, good dinners. 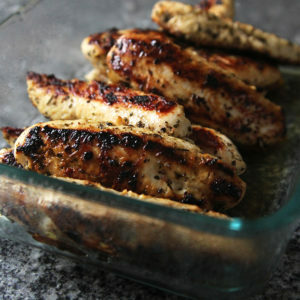 I love a meal that can be ready in a mere 20 minutes. 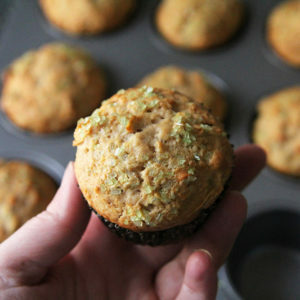 And I especially love one that blends a touch of convenience with a lot of nutritious goodness. Quinoa with Ribs and Sautéed Veggies is all that. A batch of quinoa — love protein-rich quinoa — is the bed for this dish. Ribs, which come already cooked and hot, join a sauté of onions, sugar snap peas and corn for a tasty (but not heavy) meal. 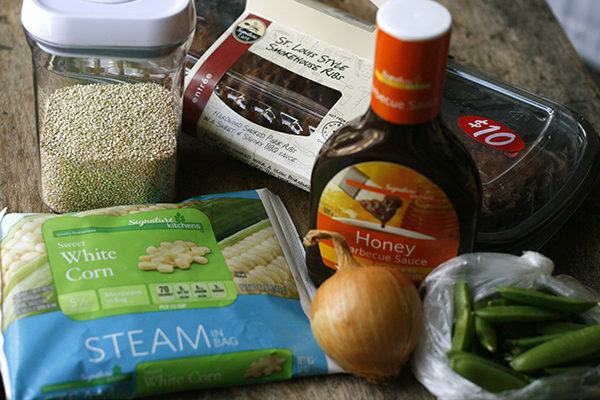 Start by cooking the quinoa, which takes about 20 minutes from start to finish. I like to use a ratio of slightly less than 2:1 water to quinoa when cooking it, because it gives the quinoa a firmer texture. Also, be sure to always rinse quinoa before cooking — the outer layer that you’re rinsing away is bitter. Then, make the sauté. Start by cooking some sliced onions in olive oil. Season them lightly with salt and pepper. When they begin to turn golden brown, it’s time to add the sugar snap peas. And about those … I was inspired to cut them lengthwise for this dish after seeing a recipe for a delightful Snap Pea and Feta Salad on A Thought for Food by Brian Samuels. I haven’t cut them this way before but I loved the way they worked in the dish with long, thin strips. The shape and size mirrored the onions and cooked to a nice, warm crisp-tender. Just perfect. Next, you add in the corn. I love the sweetness corn brings to this recipe. 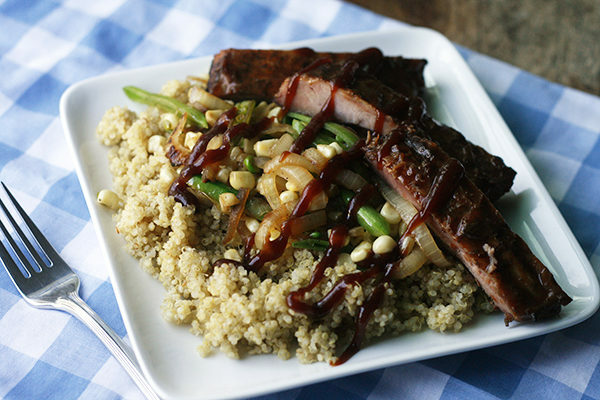 Finally, you put it all together — a bed of quinoa, a pile of veggies, some ribs and a drizzle of barbecue sauce. Just perfect. 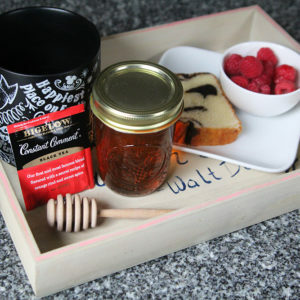 I’ve partnered with to create this recipe. I used their Signature Cafe® ribs, which are found near the deli with the hot foods all ready to eat. 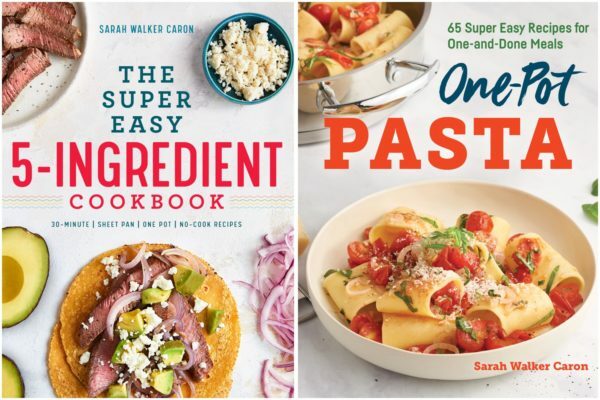 Shaw’s has a store brand, Signature, that includes so many great products from kitchen staples like flour and sugar to coffee, soup, frozen foods, produce and so much more. For this recipe I used the Signature Cafe ribs along with Signature Kitchens® frozen corn and barbecue sauce to give the dish lots of flavor and nutrition. Did you know that the Signature line includes more than 4,000 items and all have a 100 percent money back guarantee? And if you don’t have a Shaw’s near you, don’t worry. You can find the Signature line at all Albertsons Companies grocery stores, including Albertsons, ACME Market, Safeway, Jewel-Osco, Vons, Pavilions, Randalls, Tom Thumb, Star Market, United Express, United and Carrs/Safeway. And, one more thing … if you happen to have any leftovers, I have it on good authority from my kids that they make excellent lunches for school too. In a large skillet, heat the olive oil over medium heat. Add the onions and season with salt, pepper and paprika. Cook, stirring occasionally, until golden. Add the sugar snap peas and cook until just crisp-tender. 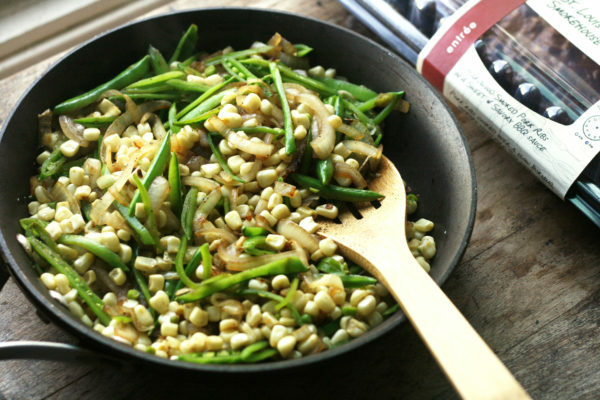 Stir in the corn and season with additional salt and pepper, as desired. Divide the quinoa evenly among four plates. Top each with the sautéed veggies and then a few ribs. Drizzle with additional barbecue sauce. Enjoy. I love a dish that can be made in a short amount of time also and is also healthy. This is a beautiful meal that you have created! Looks really tasty! That meal surely looks very filling..and nice reading about your kids…spending time with them, talking about their school day is surely an interesting time.. I love quick easy meals especially in summer It’s so hot here I feel lazy to cook.. This sounds so yum. Pinning for later. What a fantastic, complete meal – looks ideal for this weekend’s heat wave here. And in just 30 minutes? Sold! Looks like a great dish to me. I love eating quinoa, it is such a great ingredient in so many recipes, both savoury and sweet. These ribs look so delicious. What a lovely dinner very nice ribs that glaze looks so good, And the quinoa salad is just perfect. I do love a quick protein-rich meal that is also delicious. Quinoa is by far everybody’s favourite when it comes to healthier choices. Those ribs look so good, haven’t had some for quite a while actually. I just love this! When I think ribs I usually think mash and other unhealthy sides, but this quinoa and veggie side is just perfect. This sounds like a flavorful dish, and I love how simple it is to put together. COrn is one of my favorite vegetables and it goes so well with peas. This looks amazing! 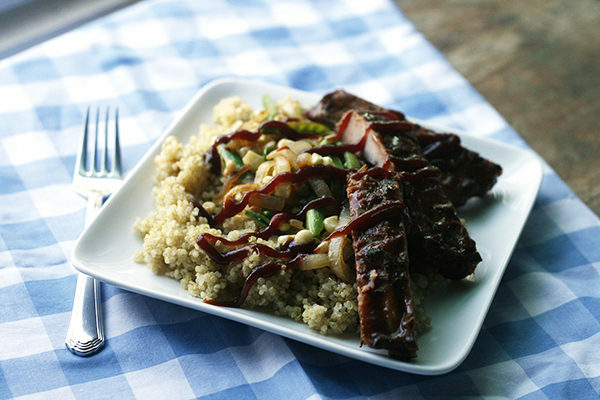 I never would have thought about combining quinoa and ribs, but it’s such a great idea! 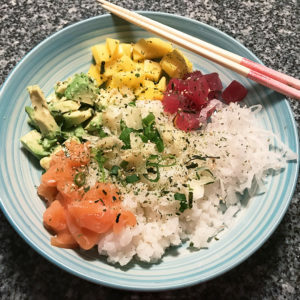 This is not only healthy but also delicious meal with lot of flavors also easy to put together. Better than ribs with mashed potato. That sounds like a perfect meal on busy weekdays or even weekends. 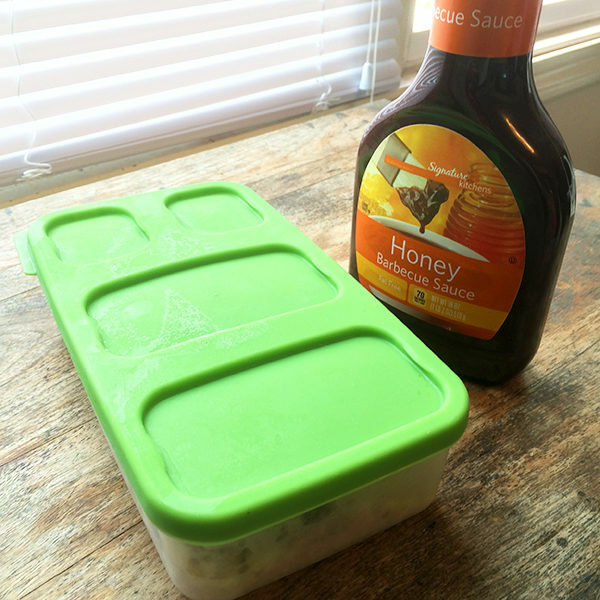 I love the simplicity of the ingredients and the addition of honey would give such a nice sweet element to ribs flavoring. I love the balance in this with the hearty quinoa and the rich ribs and the fresh veggies. Smart move cutting the beans lengthwise – I always forget about that as an option too! 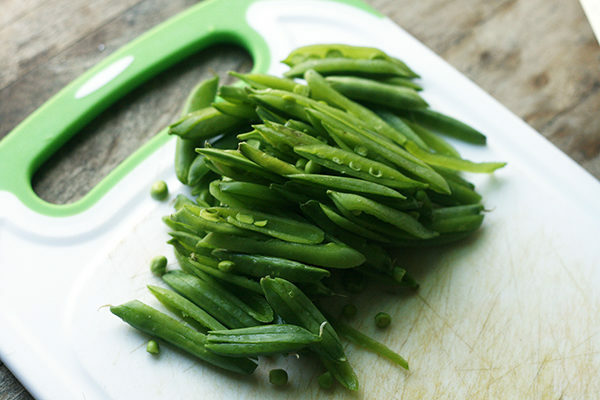 I don’t know if I have ever seen sugar snap peas cut lengthwise like that before, but it really makes the dish look exquisite and extra elegant! I would guess you spent more than 20 minutes on it!